The upward pointing finial says it all: The sky's the limit when it comes to the enjoyment you and your birds will reap with this magnificently designed and constructed mansion. 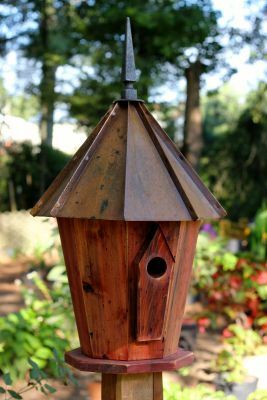 You might say that the finial is also a finale to a bravura design that starts pleasingly at the cypress base and sides and builds to a grand finish with the handsome roof of brown patina copper or galvanized metal. Call it an "innspired" approach to human hospitality for feathered friends. Comes with metal mounting plate.